Speaking of motor racing, its future is certainly Formula E racing series. For three years of its existence, E racing has become very stylish in the world of motor racing. It embodies progress, high technologies, and ecology. The futuristic design and electric engine correspond to the modern concept of racing. The Dragon Racing Formula E Team founded by top managers of Seagate Technologies started its motor history in 2006 as Luczo Dragon Racing. In May 2007, the team debuted in legendary Indianapolis 500. Two years later, the team finished its first season in IndyCar named as the novice of the year. Currently, Dragon Racing performs in Formula E. The team reached the first triumph already in the first Formula E season due to the victory of Jerome d�Ambrosio in Berlin. Two weeks later a car with the InstaForex brand appeared for the first time within the debut of Formula E in Moscow. Besides InstaForex, McAfee, Microsoft, TrueCar, and Chevrolet have been the partners of Dragon Racing. The team is headquartered in Los Angeles, US, and its factory is situated in Donington, UK. 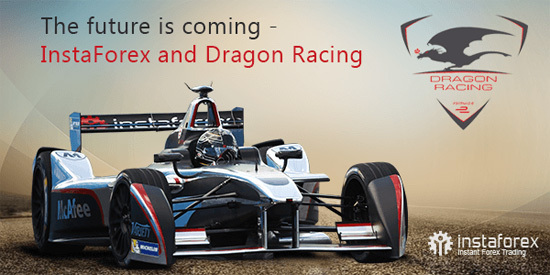 InstaForex sincerely wishes Dragon Racing success and outstanding victories in Formula E!